Synopsis:. An air marshal springs into action during a transatlantic flight after receiving a series of text messages that put his fellow passengers at risk unless the airline transfers $150 million into an off-shore account. 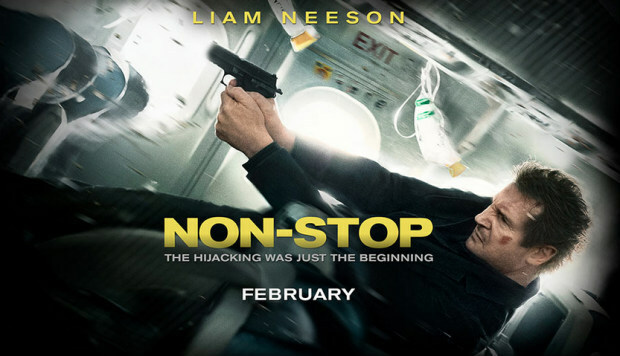 Air Marshal Bill Marks (Neeson) boards a plane, win what he thinks will be regular flight. Little does he know, a passenger on the plane sends him a text over the private network warning him a passenger will die every twenty minutes unless $150 million is transferred to a specific bank account, that later turns out to be his. Now, over the Atlantic Ocean, Marks is in a race-against-time to find the man who is framing him and threaten to kill people on the plane. Once we get in the plane, everyone is pretty much a suspect. Ranging from his seatmate Jen Summers (Moore), one of the many ticked off passengers (Stoll), tech app inventor (Parker) and the flight attendants which is lead by Michelle Dockery. With so many suspect and no good lead, Marks is desperate before the clock goes to zero. Marks badgers the passengers and occasionally grabs them roughly for some interrogation. With no one to trust, force is his only option, even if it makes him look like the bad guy to the people on board and the authorities on the ground. Neeson does his thing as usual, playing the gruff badass character who is a little broken inside. His character isn’t necessarily innocent, which gives the character some levity, but that’s getting into spoiler territory so I’ll let you witness that on your own. Moore also does her thing trying to help Bill solve everything but, again, is somewhat suspicions. Dockery’s flight attendant Nancy also tries to help Bill but when he starts to take extremes she starts to doubt whether the threat is real or not. Other smaller roles include; the other prominent flight attendant Gwen played by 12 Years a Slave’s Lupita Nyong’o, co-pilot Kyle (Jason Butler Harner), Corey Stoll and Scoot McNairy. Harner, Stoll, McNairy and Nate Parker characters give Bill some challenges along the way, but of course nothing can stop Bill from trying to find his target. One of the nice things about the movie is that it could have gone into the usual thriller tropes but it keeps the viewer guessing until the very end. It’s probably what makes this movie work so well in that aspect. However, in the last act of the movie when we find out the person responsible it does kind of get to generic territory. All in all, Non-Stop could have been a cliché/generic and predictable thriller but instead director Jaume Collet-Serra and co. bought their A-game and gave us an enjoyable who-done-it thriller.